29 Sep 2016 Durham, N.C. Even as the changing fall scenery gives us picture-perfect views, many North Carolinians are still reluctant to explore the outdoors. Some people don’t venture out to North Carolina’s parks, forests and trails because they don’t know about all that the state has to offer. Others are worried they aren’t in good enough shape to take on nature, or that they might get lost by themselves out in the woods. 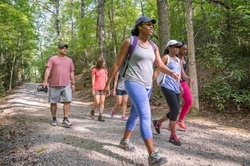 This fall, Blue Cross and Blue Shield of North Carolina (Blue Cross) and the North Carolina State Parks system launched Hike NC!, a new community initiative that will take the hesitation out of hiking and encourage North Carolinians to get moving. Hike NC! is a series of more than 60 guided hikes in North Carolina’s state parks and nature preserves, led by the state’s top hiking and nature experts. In addition to helping North Carolinians get active outdoors, Hike NC! is also part of Blue Cross’ efforts to promote health and well-being among North Carolinians. People who are physically active are at lower risk for chronic conditions and diseases, including heart disease, stroke and diabetes. The inaugural hikes for the initiative begin this weekend and run through the end of the year. 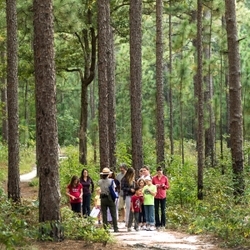 Residents can learn more about hikes in their area by viewing the full list at gohikenc.com. Visitors can find hikes by region and sign up for a hike that’s right for them, based on distance, time, location and level of trail difficulty. After people sign up online, they’ll simply need to show up, meet their guide and begin hiking. Hike NC! is a collaboration with leading hiking experts across the state. Guides from North Carolina State Parks, which is celebrating the 100-year anniversary of the state parks system, will lead hikes and foster memorable experiences for hikers. Hike NC! is supported by North Carolina State Parks, Friends of North Carolina State Parks, North Carolina Recreation & Park Association, Great Outdoor Provision Co. and GetGoingNC.com. Joe Miller, author, avid hiker and Chief Exploration Officer at GetGoingNC, will lead hikes as well. Residents can join the Hike NC! conversation on Instagram and Facebook using #HikeNC.